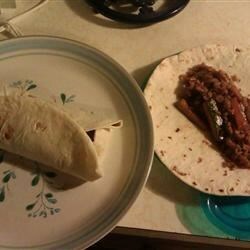 "Teriyaki rice and veggie wraps." In a saucepan bring 2 cups of water to a boil; add rice. Reduce heat, cover, and simmer for 20 minutes. Heat olive oil in a large skillet over medium heat. Saute onion, bell pepper, zucchini, and yellow squash until onions are tender. Stir in the teriyaki sauce. When the vegetables are tender, stir in the cooked rice, soy sauce, garlic powder, salt and pepper. Simmer for 3 to 5 minutes. Place 1/4 of the rice and vegetables in each tortilla, and roll up. My only reccomendation for this recipe is do not add the salt. There is enough in the teriyaki and soy sauces. For those who want to watch their sodium buy low sodium versions of these sauces. Try adding cashews for a pleasant crunch.